I am sure that you all will agree to the point that the Shops here in Dubai are all the same. Most of the shops are replicating the same model over and over like Ramadan Sale, National Day Sale, EID Sale and Shopping festival sale. As a customer i get bored of the same sales every year. I was in search for a new shopping experince. Yesterday i happened to visit a newly opened shop name Sample Central where you can shop products for free. You might be wondering already by hearing the word FREE. Yes, as i said you can shop products for 100% FREE. Your currency in sample central is only your Opinion. Idea is quite easy to digest. Get products and give your feedback about the product. I am sure that you guys already tasted the sample products like tea,ice cream,maggi etc in Carrefour and Lulu Hypermarkets. Sample central almost works on the same idea by giving you free products to its members in a centralized systematic way. The staff and customer service of the store is really awesome! Being a bronze member I was able to walk out of the store with 5 samples and three freebies. You might even surprised by hearing the list of items i shopped for FREE. It includes Parachute Hair Cream, Fa Deo, Dabur Vatika Cream, Heinz Fiery Chili Ketchup, Bic Gents Razor and TIC TAC. It really gives me a first hand experience of different branded products without actually spending even a penny. Sample Central is a unique retail experience where members get to try out the latest, new and existing products. All they ask for in return from members is to pay with opinions for the products selected. Your opinion has never been valued as much! 1 Member: Fill in the registration form and pay AED 100 annual fee. 2 Gain access: Schedule your visit to Sample Central. 3 Visit the store: Select the products you want to experience. 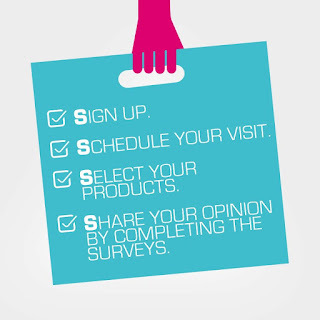 4 Pay with your opinion: Complete online feedback surveys for the products you had the opportunity to use. So why are waiting, Join Sample Central now itself!! !